What Are the Basic Vitamin & Mineral Supplements a Man Over 50 Should Take? As your body changes with age, so do your nutritional requirements, In order to deal with the effects of the natural aging process, men will need more of certain vitamins and minerals to help prevent diseases they are more at risk after age 50. Although you should try to get as many vitamins and minerals as you can from food sources, in some cases a vitamin or mineral supplement may be needed. Osteoporosis becomes a serious concern as men reach the 50 year mark. Osteoporosis is a disease that causes the bones to weaken and more easily break. One way to help reduce your risks of developing osteoporosis is by ensuring you get the right amount of vitamin D, which is needed to absorb calcium. According to the National Osteoporosis foundation, men over 50 need 800-1,000 IU of vitamin D every day. You can get vitamin D through sunlight, the foods you eat -- such as vitamin D fortified milk -- and vitamin D supplements. For vitamin D to be helpful, you must also ensure you get enough calcium. Calcium is needed to build dense and strong bone structure and to continue the overall health and strength of the bones as you age. The NOF recommends that men over 50 get 1,200 milligrams of calcium every day to help prevent osteoporosis. Another risk factor that increases in men with age is the development of Alzheimer's disease, which causes cognitive deterioration and problems with memory, and which may eventually result in death. 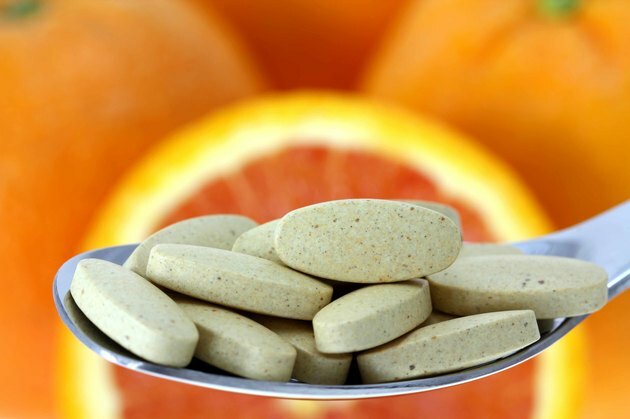 Studies performed by Johns Hopkins University and published in Archives of Neurology in 2004 state that one way to help prevent the onset of Alzheimer's is adequate levels of vitamin C. The National Institutes of Health recommend that all men over 50 get at least 90 mg each day of vitamin C, either from natural sources or a supplement. Vitamin E also plays a role in preventing Alzheimer's as you age, according to Johns Hopkins. When combined with vitamin C, the antioxidant effects of vitamin E may help protect brain cells from damage over time. Men over 50 should aim for 15 mg of the vitamin, but should not exceed 400 IU each day due to possible serious health complications, says a 2004 statement by the American Heart Association. Prostate cancer is another worry for many men over the age of 50. A nutrient that has made its way into multiple prostate cancer-related studies is a nutrient called lycopene, states Mayoclinic.com, which is largely found in vegetables like tomatoes. Lycopene supplements are widely available on the market to help prevent prostate cancer; however, it is more widely recommended that you increase your overall consumption of fruits and vegetables to help prevent prostate cancer instead of focusing only on a single supplement. Atherosclerosis, or the buildup of fat in the blood vessels causing arterial damage and blood clots, is another concern for men over 50. One contributing factor to this disease is an amino acid in the blood called homocysteine. B vitamins and folic acid can both help break down homocysteine in the blood, helping reduce your risks for atherosclerosis, states the American Heart Association. You should only take a supplement for these nutrients if you are incapable of getting them in your diet through foods like tomatoes, fruits vegetables and grains.